Interested in becoming a Kowhai Guy? Are you already in the roof coating business and wanting to take your business to the next level? Do you want to grow your business in partnership with a trusted New Zealand brand? Are you too busy working in the business to work on the business? Are you thinking that it is time to spend less time ‘on the tools’ and more time developing your business? ​Maybe you are thinking about how to increase the value of your business when it comes time to sell? Read on as joining the Kowhai Guys network will help you to achieve your goals. 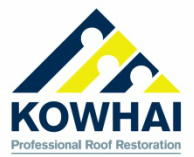 For many years Kowhai Roof Coatings has provided quality roof coatings and application systems. Through our dedicated team of Kowhai Guys, we have been restoring roofs throughout New Zealand, but we have a limited number of opportunites in some key areas. Access to qualified leads generated through the centralised marketing efforts of the Kowhai Support Office. Exclusive rights to promote the Kowhai brand in a dedicated geographical area. The brand and marketing strength that comes with becoming a Kowhai Guy. Access to quality products - developed in New Zealand for New Zealand conditions. How to promote your business at a local level. Managing leads / customer enquiries. Customer service - the Kowhai Way. The use of the Kowhai Group Instruction Manual and our Products and Systems Manuals. Regular field visits from the Kowhai Support Office team providing business support and mentoring to help you to take control of your business and take it to the next level and beyond. Support and encouragement from your fellow Kowhai Guys who are in the same business as you, but are not your direct competitors. ​If you are interested in finding out more about becoming a Kowhai Guy in your area, please complete the following expression of interest and one of our support office guys will get back to you. Note: This is not a contract and does not obligate you in any way.